Apple on Thursday began alerting Photos users on the Mac that it will stop taking orders for its Photo Print Products service after Sept. 30 this year. 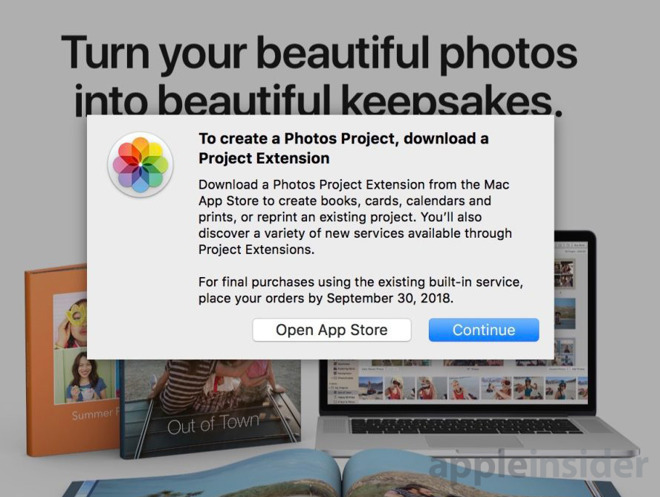 macOS 10.13.6 users working in Photos are seeing a pop-up about the deadline, which also includes a recommendation that people download a third-party app with a Photos Projects extension. This lets developers build a photo printing interface within Photos, though the actual payment and printing is outside of Apple's hands. Photo Prints Products has been around since 2002, when it was a part of iPhoto. By the time it reached full scale people were able to order albums, books, and calendars, as well as individual prints. The company has never carried the service over to iOS however, and it appears to be completely absent in betas of macOS Mojave. That OS is due to launch sometime in the fall, and indeed the Sept. 30 deadline may suggest that Mojave will ship sometime in September, which would be in keeping with past macOS rollouts. High Sierra, for instance, went live on Sept. 25 last year. The service has likely dwindled in importance as Apple's customer base has become increasingly iPhone- and iPad-centric. The demand for physical photos has shrunk too, with many people only caring about having digital copies they can message or post on social networks.